Pennsylvania Voter ID Law Struck Down : The Two-Way The state's controversial law threatens the rights of hundreds of thousands of potential voters, a judge has ruled. His decision is almost sure to be appealed. Republicans champion the law, saying it's common sense to require such identification. Democrats say it targets minorities. 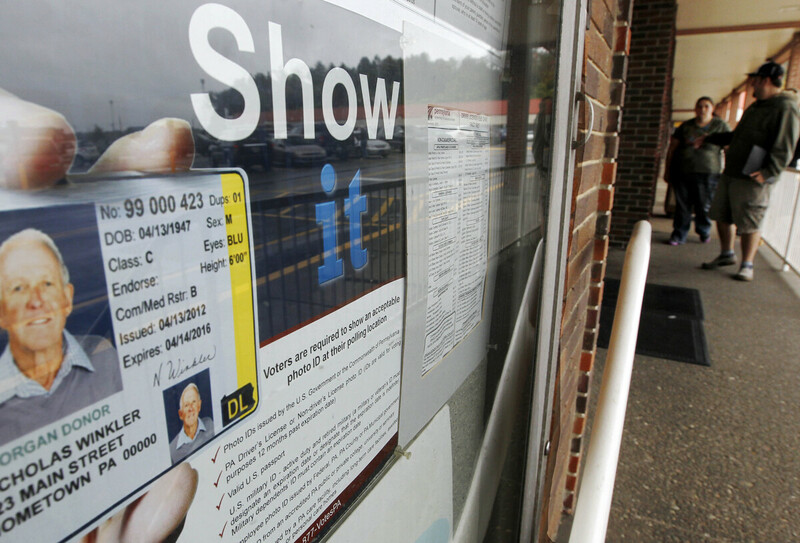 Before the voter ID law was put on hold, this Penndot Drivers License Center in Butler, Pa., displayed signs promoting the requirement for voters to show an acceptable photo ID at the polls. Ruling that "voting laws are designed to assure a free and fair election" and that Pennsylvania's "Voter ID Law does not further this goal," a state judge on Friday struck down that controversial statute. Pennsylvania Commonwealth Court Judge Bernard McGinley's ruling is posted here. "McGinley said the requirement that was the centerpiece of Pennsylvania's embattled 2012 voter identification law places an unreasonable burden on the fundamental right to vote. "The decision paves the way for an expected appeal to the Pennsylvania Supreme Court. Republicans approved the law over the protests of Democrats. "During a 12-day trial this summer, plaintiffs said hundreds of thousands of voters lacked acceptable IDs and the inconvenience of getting a photo ID might discourage some from voting. State officials insisted there were ample opportunities for voters to get a valid ID if they had none. "The court has barred enforcement of the law since [shortly before] the 2012 general election." In his opinion, McGinley writes that the law presents a "substantial threat" to the rights of "hundreds of thousands" of potential voters. As All Things Considered has reported, the law would require voters "to show a particular state-issued photo ID before casting ballots. ... Supporters say photo ID is a common-sense requirement that keeps people from impersonating someone else and casting a fraudulent ballot. Opponents say it's an attempt to disenfranchise minorities and Democratic-leaning groups, who are less likely to have photo identification." The legal challenge, as NPR reported, was "filed by the American Civil Liberties Union with 93-year-old Viviette Applewhite as the lead plaintiff. She's a longtime voter, born in Philadelphia, who wouldn't be able to get the ID she would need under new rules because she doesn't have a birth certificate or other key identifying documents, such as a non-driving license."